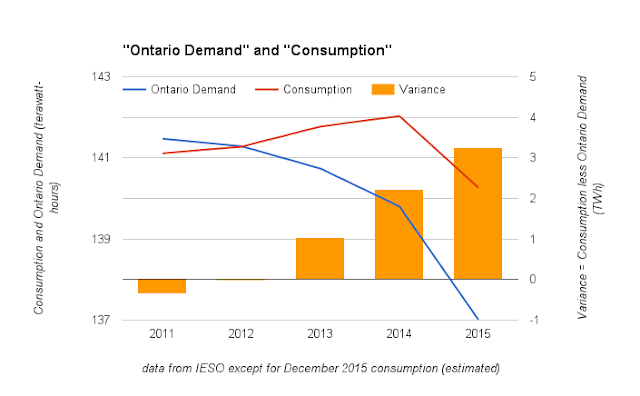 The electricity sector data widely communicated by the system's operator (the IESO) is increasingly inadequate for analysis of cost and demand trends in the province. This post needs to utilize more obscure data, and the creation of some data through estimates, in order to demonstrate the causes of overall higher prices and the shifting of costs to the smallest consumers of electricity. 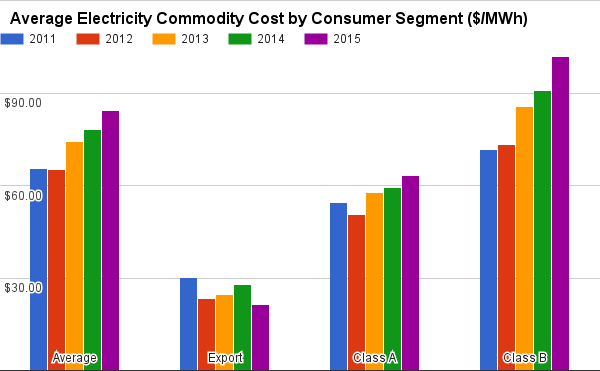 2015 continues a trend of rising overall electricity costs, and the increases are amplified by 50% for small consumers. Consumers can be broadly grouped into three groups: exporters, Class A and Class B. In 2015 a new website appeared that does provide a quarterly report indicating the much different pricing for Class A consumers ("large electricity consumers"), and all other domestic consumers - Class B. Up to the end of the September the total pricing for the classes was quite different: Class A had averaged $6.24 cents per kilowatt-hour ($62.40/MWh), which was 37% lower than Class B's 9.89 cent/kWh average. To understand the cost drivers it's useful to first examine the difference between the forms of generation the IESO considers "Ontario Demand", and the metered consumption of Ontario consumers. The IESO provides, upon requests, figures for "consumption" by the consumer classes defined by the global adjustment mechanism/s. With these figures, and the breakdown of the global adjustment totals by class A and class B published by the IESO, it is possible to recreate the reported average commodity rates. 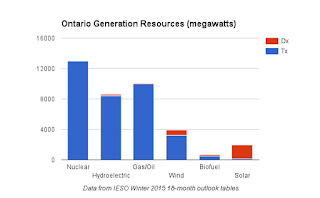 The widely cited "Ontario Demand" refers to demand for supply from transmission connected (Tx) generators. Other generators are connected within distribution grids (Dx). Consumption figures for December won't be available until after the global adjustment totals are finalized in mid-January, but we have enough data to estimate 2015 and demonstrate that over the past 5 years "consumption" in Ontario has gone from being less than "Ontario Demand" to exceeding it. The change in the the difference between Tx generation ("Ontario Demand") and consumption means that generation is increasing within distribution (Dx) networks. It should be expected that Dx generation data be reported along with Tx data to properly communicate component supply costs. 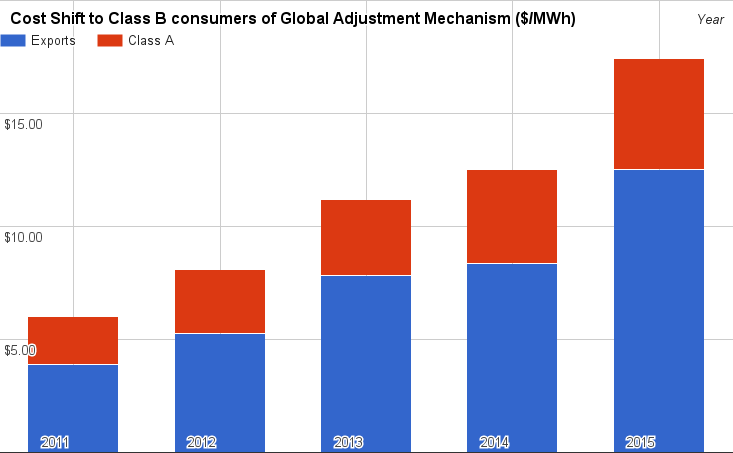 Class B consumers pay a greater share of the global adjustment. The average commodity cost in 2015 is $84.34/MWh in the chart, which essentially agrees with a news release in early December putting "the average price of electricity generation" at $83/MWh. in 2015 exporters paid $1.423 billion less than their supply costs, up $960 million from 2011. The cost impact on most Ontario ratepayers (Class B) of exporters and large users paying less than the costs of supply has grown to add ~$17.40/MWh to most Ontario electricity charges, including ~$12.50/MWh in 2015 due to exports sold below the cost of supply. The review of demand/consumption demonstrated the growth of embedded generation (Dx), which is indicated as being greater than the growth in (Tx) generation over the past 4 years, particularly in 2015 which saw growth only in embedded generation. The IESO offers no meaningful reporting on production from embedded generators, although it does offer enough information on embedded generation capacity to allow meaningful estimates. The most significant distortion of reporting in omitting Dx generators is solar as those generators are primarily embedded in distribution networks. Another significant issue in estimating component costs is the paid curtailment of generators. 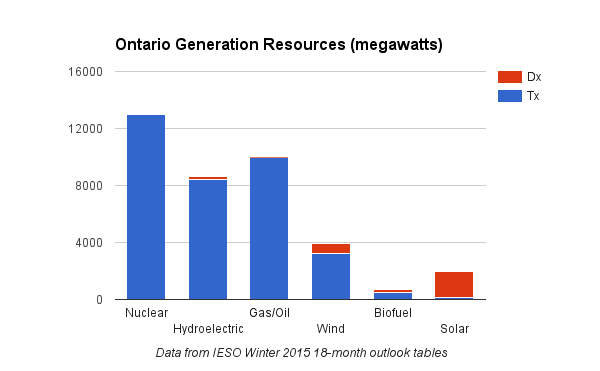 The IESO offers occasional glimpses of curtailed wind and nuclear generation (see Figure 6.1 of Winter 2015 18 month outlook), but offers no indication of what is indicated by Ontario Power Generation (OPG) as the most frequently curtailed supply; hydro. For 2014 OPG reported "approximately 3.2 TWh" of hydro curtailed, and their 2015 third quarter reporting had curtailment up sharply for the first 9 months of 2015. 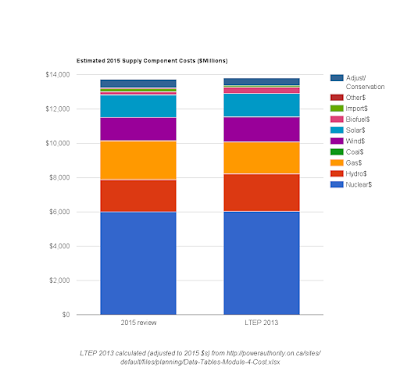 Before offering conclusions from analyzing my own estimates of costs over the past 5 years, I present this chart comparing my estimated components of overall supply cost for 2015 to the spreadsheet estimates prepared by the former Ontario Power Authority for the 2013 Long-Term Energy Plan (LTEP). The differences between my post-2015 estimate of the year's electricity supply costs and the OPA's anticipated costs for the year are minor. 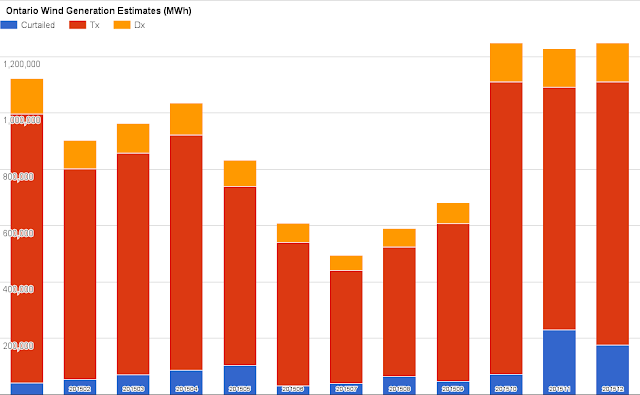 I have collected 5 years of hourly generation data and, adding estimates for Dx generation and curtailment costs for wind and nuclear. The cost has increased $3.6 billion, which is 35%. 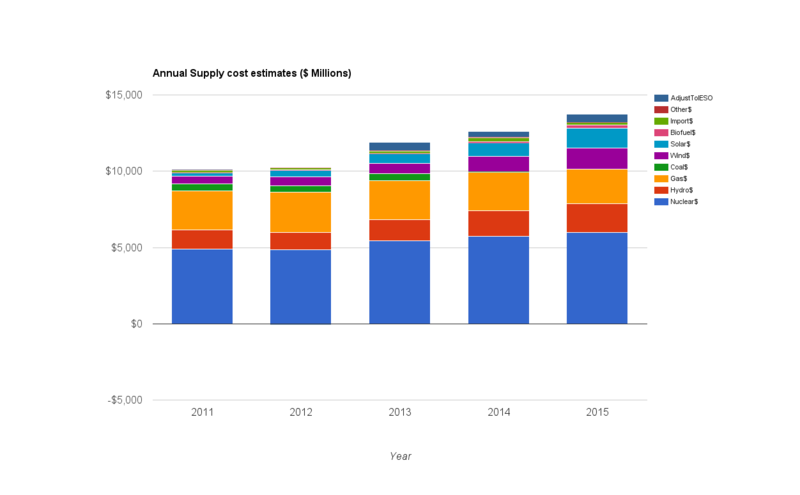 The greatest increase in costs in 2015 was almost certainly due to solar, most of which is embedded and will almost certainly go unreported in the IESO's summary of the year's production metrics. The second highest annual cost increase likely came from increased wind generation - and curtailment of wind generation. The last 3 months of 2015 were particularly windy, and warm. The inappropriateness of wind as a power source in Ontario was demonstrated as curtailed supply in November and December neared the total output from transmission connected turbines for all of July. My cost estimates show wind and solar responsible for 70% of increased supply cost in 2015. The impact on class B consumers is greater than that, as increasing supply further depresses the marker price.